· (Photo Lens Angle 120° + 3D Flip) With the professional 120° angle lens, you can capture more range of view, more clear light, take pictures and more spectacular video, higher definition. 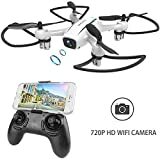 The very wide shots (120°) and the stability of the camera contribute to the quality of the rendered images (3D-Flip) The 3D-flip function makes your flight exciting, you can try adventurous rotations like Drone Racing Combat, very cool. · (3 speed modes + headless mode) speed (30 - 60 and 100%) to help you practice your step by step flight skills, so you can move from beginner level to expert level progressively. Surprised by the reaction speed of the machine (Headless Mode) With Headless Mode, it is not necessary to adjust the position of the aircraft before the flight. Control is easy and during the flight and do not worry about the direction. Clearer and faster.